Pumpkin seeds shouldn’t be relegated to the back shelf for the other 11 months of the year when Halloween preparations aren’t underway. These healthy seeds deserve to be part of your weekly meals. Not only are they full of minerals (they’re a great source of zinc), they’re also high in disease-fighting antioxidants. Let’s take a look at the six reasons why you should eat a handful of pumpkin seeds every day. 1. Pumpkin seeds are a good source of zinc. Even the World Health Organization (WHO) has recognized that pumpkin seeds are an excellent way to boost your intake of zinc. Zinc is needed to support the function of hundreds of enzymes, to boost your immune system (particularly during cold and flu season), and to help maintain sexual function. 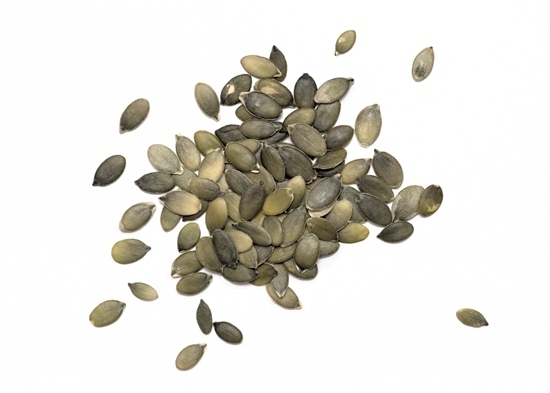 To get the most zinc out of your pumpkin seeds, try eating them with the shell on. This is because zinc tends to concentrate in the endosperm envelope. This tiny layer separates the seed from the shell and it is very difficult to remove it intact if you are going to eat the seeds by themselves. The shells contain a little more fiber than the seeds, but the extra chewing should be worth it in terms of your health. 2. Get a dose of antioxidants without worrying about adding even more vegetables to your diet. Alright, all you eaters out there who grumble about having to eat veggies, pumpkin seeds can be an alternative way to boost your intake of health-protecting antioxidants. Pumpkin seeds contain an amazing variety of antioxidants that many other foods simply don’t have. 3. Keep your vitamin E levels up. Pumpkin seeds are high in vitamin E. In fact, pumpkin seeds contain just about every form of vitamin E that you can think of: alpha-tocopherol, gamma-tocopherol, alpha-tocomonoenol, gamma-tocomonoenol and gamma-tocopheral. Why do you need so many different forms of vitamin E? Because some are more readily absorbed by the body, which ups your chances of benefiting from the consumption of this antioxidant vitamin. 4. Up your intake of phenols. Phenols found in pumpkin seeds include caffeic, vanillic, syringic acid, coumaric, ferulic and sinapic. Phenols help protect your cells against damage. 5. Boost your levels of key minerals. Pumpkin seeds are very high in phosphorus, manganese, tryptophan, and magnesium. Phosphorus is important for healthy bone formation, good digestion, protein synthesis, hormonal balance, and nutrient absorption. Manganese is needed for proper metabolic activity, bone metabolism, normal functioning of your thyroid, and calcium absorption. Tryptophan is needed for balancing mood and boosting mental function. And finally, magnesium is important for just about everything (transmission of nerve impulses, body temperature regulation, energy production and detoxification, to name just a few!). Pumpkin seed oil has been shown in numerous clinical trials to have a beneficial effect in the treatment of BPH. The fatty acids and plant sterols in pumpkin seeds are thought to improve the function of the urethra and bladder. Kalogeropoulus, N., “Nutritional evaluation and health promoting activities of nuts and seeds cultivated in Greece,” Int J Food Sci Nutr. September 2013; 64(6): 757-67. Nawirska-Olszańska, A., et al., “Characteristics of antioxidant activity and composition of pumpkin seed oils in 12 cultivars,” Food Chem. August 2013; 139(1-4): 155-61. Ejike, C.E., “Inhibition of the experimental induction of benign prostatic hyperplasia: a possible role for fluted pumpkin (Telfairia occidentalis Hook f.) seeds,” Urol Int 2011; 87(2): 218-24.